Our 60,000 sq. 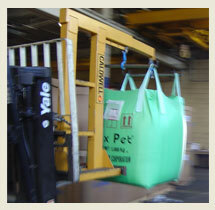 ft. dedicated pack-out warehouse with custom-made packing machinery allow us to process for than 150,000 lbs. of material daily. We provide boxing, bagging of bulk material and Super Sack trans-loading from sea containers. We maintain a clean production line and have four smaller lines for handling specialty products, eliminating cross-contamination of more sensitive products. Dameo Trucking is proud to be affiliated with respected business, trucking and service organizations, some of whom we've been associated with for over 50 years.